Yesterday I went through hundreds of startups’ Facebook pages. Why? I built a new list of hundreds of startups. You should subscribe to it. I also added a lot of investors onto my startup investor list. Subscribe to that one, too, and you’ll know what the money in the industry is thinking. Finally I also built a new list for programmers. Why on Facebook? I’ve noticed a change lately. Facebook is the best place to build lists like these. Why? 1. Everyone is on Facebook. It is very rare that I can’t find a startup. Out of the 72 Y Combinator startups almost all of them were on Facebook. 2. The list-building facility in Facebook is better than Twitter or Google+. Twitter limits me to 500 things on each list. Facebook doesn’t. Plus, if you subscribe to lists they actually put some items from each list onto your main feed. Twitter doesn’t do anything when you follow a list. Finally, I haven’t hit a list limit yet on Facebook, where on Twitter I’m limited to 20 lists. Anyway, that’s a long way of getting around to some things I’ve noticed that Startups could improve on when launching their companies (I’ll be at Techcrunch Disrupt with our awesome new video studio thanks to New Tek’s Tricaster to meet the latest startups launching. If you have a startup that’s launching there, make sure you email me and get on our calendar. scobleizer@gmail.com. If you want to go I arranged a $100 discount, use the Scobledsf12 code). 1. Get a name that’s searchable on ALL services. It’s amazing that about 10% of startups couldn’t be found on Facebook because they had common names or names that weren’t searchable. 2. Make sure a description of your business is on your Facebook page. Quite a few didn’t have a description. 3. Make sure you link to your website. It’s amazing to me to see how many businesses don’t link back to their main website. 4. Make sure there’s a call to action on your Facebook page “Download our app today and you’ll get $10 off” for instance. Very few startups do this. Ask for the sale! (Or the download or the click). 5. Use photos and videos often. The best startups post lots of imagery and videos. The worst ones? Text only. 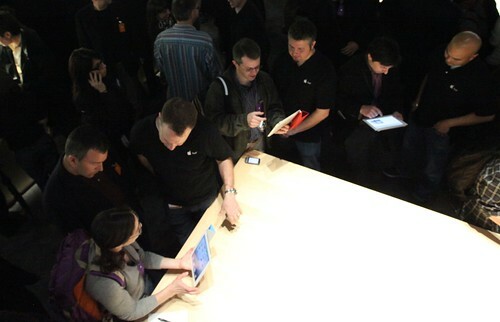 This is one reason why I take photos, so I’ll have some to use on my posts in the future (the photo above I shot at the iPad 2 launch). While I’m thinking of Techcrunch Disrupt, here’s some ideas for how you can use your Facebook page to scale out your conference investment (it is expensive). 1. Post photos of your staff uniforms BEFORE the event. You do have a staff T shirt, right? Y Combinator does this so well. 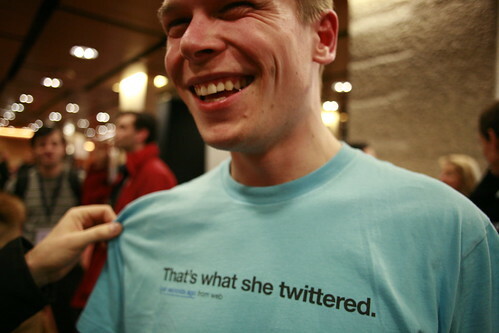 Every company at its demo day last week had its employees wearing a company T-shirt. 3. Make a list of competitors who will be disrupted by you. You do have competitors, right? You are better, right? If not, why are you going to Disrupt? Post a blog post about them and what makes you different. Heck, post a blog post about what makes THEM better than YOU! That will get attention and demonstrate you have real passion and credibility about the marketplace you serve. 4. Don’t listen to Techcrunch’s rules. They tell companies not to disclose what they are doing to journalists ahead of time. This is risky, yes. If one of those journalists leak before you get on stage you might get kicked out of the show. So, pick some journalists you trust, and give them a sneak peak, but embargo them. They will have a deeper story to augment the few minutes you get on stage. Companies that don’t take this risk really are lame and really ruin their “coming out” chances for huge and deep coverage. Remember, great companies are built, not launched. 5. Make sure your signage explains what you do quickly and efficiently. It’s amazing when I walk through an expo hall and can’t figure out what a company does just by walking past its booth. On Y Combinator’s brochure every company was described in four words or less. BufferBox simply said “Drop boxes for packages.” Vastrm says “Warby Parker for shirts.” Instacart says “Groceries delivered fast.” Everyday.me says “Personal timeline.” Every company figured out what it was and shrunk it down to four words or less. Everyone. You have no excuses. 6. Have a “schtick” that gets people to engage. Some companies have mini-golf contests. Others have funny people presenting. Others just have a fun contest. But you gotta find a way to stand out above the noise of expo halls. 7. Hand out some awesome swag. Word gets around that your booth is a must visit. Plus, even if they aren’t customers, maybe a few of the influencers will take photos of your swag and post them around. What about you? Do you have any suggestions for companies launching?